The HO version of the "Kettle Valley" is very faithful to the prototype in its topography, infrastructure, trains and operational features as they were when steam was king. The 385 foot mainline (6.3 scale miles) is stretched out over two decks with a helix in the middle and staging tracks at each end. Most of the scenery and trackage closely resemble specific locales of two subdivisions on the Westside of the Kettle Valley Division, a distance of 90 miles. The small Division point of Brookmere is the centre of layout activity at which all freight trains terminate and originate. Four passenger trains and many through freights are featured. Pusher service is run on the Coquihalla Sub. Princeton town can keep a way-freight crew very busy. At the western end, Hope has some interesting switching opportunities and interchanges with the Canadian National. There is substantial scenery completed and most structures are scratch built. Rolling stock and motive power are detailed and accurate for the period. Session Parameters: The regular daytime sessions run about 4 1/2 hours including a recess at the midway point. Occasional evening sessions are shorter. We run a full day starting at midnight on a specific day in September, 1949 using a 24 hour Clock. The Ratio is set at 6:1. Several remote clocks are mounted in the lighting valance around the layout. “Excess height” (6”- 2”) model railroaders are warned about low overhead clearance to the Valances. Assignments are described at the end of the document. We attempt to arrange at least initial assignments according to guest preferences (by email) and it seems to work out. The midday break divides the session in two and allows crews to change to different jobs. Room access & misc. : You can walk in and out of the layout room at the start; at the mid-session break; and at the end of the session. But as the session starts, we close the gate after which, normal egress entails a duck-under action (hands and knees); however, for those with mobility concerns, the gate can be opened during the session when trains are clear. Washroom is upstairs to the left. There are stools in the layout room and seats in the Dispatcher's office/laundry room. A bar fridge containing juices, beer, and water is located in the train room. Help yourself! Drink Holders are distributed on the fascia of the layout. Timetable is based on the actual CPR Employee Timetable No. 94 of September 1949. Most model trains arrive or depart from Brookmere close to the prototype times. Copies of the modeled Timetable are posted on the valances and personal copies are available. As on the prototype, this railroad is a slow one and scheduled freights often run late. On the lower level is the Princeton Sub complete with a straightaway including a "curved tangent" on which trains are known to make up some of their lost time just as the KVR crews did in days gone by. In the 4 1/2 turn helix of the Coquihalla Sub, time can be made up as well where speeds of a breath-taking 32 m/p/h can be reached. 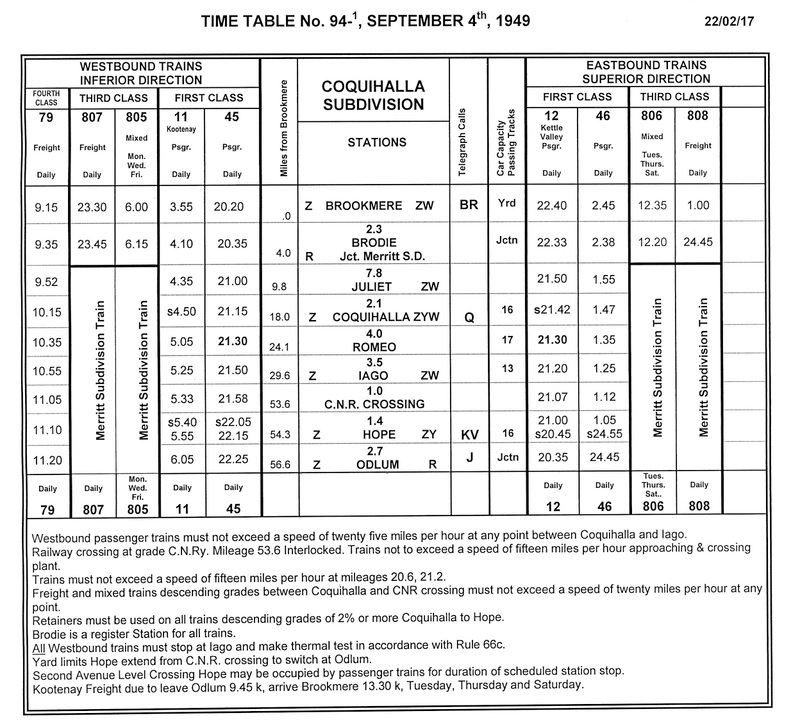 The westernmost station on the Timetable is Odlum which is the junction with the CPR mainline. A few miles to the west on the prototype was the mainline yard at Ruby Creek where KV trains originate and terminate. For our purposes, Odlum and Ruby Creek are used interchangeably to denote west staging. Train Orders: A pink Form 19 grants Authority to run from one station to another or to meet/pass another train en route. Train orders supersede the directives of the Timetable. Occasionally, a white Form 31 is issued to restrict a superior train. Most Train Orders are the basic runners, meet orders and run-lates. Clearance Card: All trains, whether Schedules or Extras, must have a completed green Clearance Form in order to leave their originating terminals. When your run is completed, all these forms can be discarded into the Company waste basket. OS /Train Report: Please assist the overworked and underpaid Station Operators to note your arrival and/or departure times at open stations as they can be very busy with many things. If necessary use a post-it note with your train designation and times inscribed and leave it on the desk of the Operator whose attention may be directed elsewhere. There are a number of "dark" stations where an OS is not applicable. No board = No report. Normally, train crews do not interact directly with the dispatcher. Register: The junction at Brodie on the Coquihalla Sub requires all trains to register before proceeding. The Train Register is a clipboard hanging on the fascia next to the entrance gate and below the model register shack. Check the entries of previous trains to assure yourself that all superior trains due have arrived and left. Interlocking Signals: Semaphore signals controlling the C N R Crossing are CLEAR so proceed without worry. The semaphores are set to “green over red” which denotes PROCEED. The competition is shut down because of a labour dispute so there is no traffic on the Canadian National Railway. Special Instructions stipulate a slow order of 15 mph over the crossing. One day we will make them work with appropriate interlocking derails. Train Card: Every train has this coaching aid inserted into the Engine Card. This gives a brief station- by- station procedure to be followed and can be perused before setting out as well as while in transit. At the bottom of the card is a PTO meaning Please Turn Over to read the second page of the Train Card. Car Cards and Waybills: standard 4 cycle for car-forwarding. The reporting marks, the car number and the body colour are printed in the colour of the actual model for ready identification. The waybills have a colour stripe overlaid with destination/direction so you do not need to study a railway map of southern BC to work the freights. At the main stations, there are trustworthy Operators to assist you in planning your moves if necessary. In Brookmere yard the dedicated switch crew can direct movements. The layout owner functions as the Station Agent for all stations and is ready to answer any of your questions. The waybills are not turned during a session. Staging: West staging (Ruby Creek has 5 tracks) is located directly above East staging (Penticton has 6 tracks). Trains are visible in staging through two opera windows. A Diode matrix controls all necessary turnouts so you simply press the appropriate single red button to select the entire route for your train for entering or leaving the staging yards. After clearing the yard ladder, reset the switches to "Normal" by pressing the green button marked “normal”. When terminating at staging, you engine will stop automatically at the end of the selected track on a dead section. Again, reline the switches to "Normal". This "Normal" setting cuts power to all staging tracks. For starting out on your run, a handy device to ensure you have acquired your train is to sound the whistle. Then linger not near the windows as the adjacent aisle can become a bottleneck. Uncoupling: Magnets are placed strategically for uncoupling but picks are also necessary. Please use the magnets when you can - especially in the yard. There are Rapido electro-magnets in Brookmere yard which are marked with a coloured pin and blue lamp when activated. Cut lever actuators for other manual magnetic uncouplers are found out on the road. There are also permanent Kadee magnets in other places. All Uncoupling Magnets are marked with a yellow pin in front of the track. 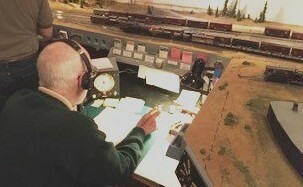 "Isolator": This is a term we coined to describe the shutting off of power to a short section of track where a loco may park and not "idle", thereby soaking up juice, hissing away at us with pop valves at the most inappropriate times and wearing out those expensive electronic decoders $$$. Two isolators are located on the shop track lead, on all the roundhouse tracks and one on the west leg of the Hope "Y". If your engine does not respond to your throttle, it could be that it is parked on an isolator. Look for a small toggle switch in the vicinity. Up is on. Throttles: Here follows a description of how to use the throttles which are CVP wireless controllers T9000 and T5000 connected to a Lenz Command Station. They are very simple and reliable to use. 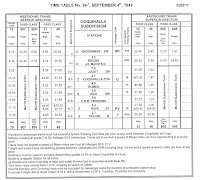 The KV was a slow mountain railroad where freights averaged about 15 mph (which corresponds to a speed step display of "15"). Passenger trains could reach upwards of 25 mph. The rotary knob is the speed controller: Turn it clockwise, to accelerate; counter-clockwise to decelerate. Push down (audible click sound is heard) to reverse the locomotive. The arrowhead pointing to the right indicates your loco will go forward. Moderate Momentum is programmed into the locomotive decoders except for the yard switcher. To acquire engine 3628, press 6 keys: #-3-6-2-8-#. Likewise to acquire engine 443, press #-4-4-3-#. It is rarely necessary to "release" or “dispatch” a loco but if you wish, #-9-# will do it. Sometimes while operating, you may press a button accidentally so that you lose control of your loco or the sound features. Simply press * (star) to recover control of the loco or sound features. Unique features: The coloured keys can help you maximize the sound options as you operate. Hopefully they are intuitive. Keys 5 & 9 are unassigned as yet (we'll think of something eventually). A cheat sheet can be found on the back of the throttle. 1 brass: bell will sound until key is pressed a second time. 2 beige with dash (--) : long whistle which will sound as long as key is held down. 3 beige with dot:(.) short whistle which will give one short toot for each press. 4 beige with yellow dot: Dim the headlight. For yard switching and meeting other trains. 6 turquoise: Water stop sound for tender fill (Coquihalla mountain water colour). 7 red is a brake function that will bring the engine to a moderately quick stop. Brake squeal sounds accompany its application. A good emergency stop function. It is also useful for fine moves such as spotting the tender hatch under the water tower or spotting a car. When pressed again the brake is released; the loco will accelerate to its previous speed step setting. 0 yellow will turn the headlight on/off. * (star) is an escape key. ------------- extra long single whistle: approaching train order office stations, watering points and railway crossings at grade. Headlight (f 0): In our steam era, headlights were only required at night or through dark tunnels and snow-sheds but you need not feel bound by this rule. Bell (f 1): is rung while approaching and passing a station platform where there may be members of the public (Princeton, Hope and Brookmere). This does not apply in most cases to yard switching nor to flag stops. It should also be rung immediately prior to moving after a prolonged stop. For example: Passenger train, No. 46, would ring its bell approaching the station platform at Brookmere until train comes to a stop. After entraining passengers, bell would sound (and 2 long whistles) immediately prior to departure until train has cleared the platform. Incidentally, Station Agents like the baggage car spotted on the platform for ease of access for the baggage carts. Another use of the bell is when your train is passing another train on an adjacent track such as at meets or at stations. Brake (f 7): As mentioned above, this feature is activated by the red button “7”. It is convenient for spotting engines accurately and for switching without adjusting the throttle. Occasionally and mysteriously, the button must be pressed twice for the engine to move after sitting idle for a while. Derailments: They can happen and you are permitted to re-rail the car or loco yourself. Be aware that most rolling stock is highly detailed and care should be taken in handling or uncoupling. 1. Enginemen’s Pool for Through Freights and Passenger Trains. A member of the engineman’s pool usually operates 3 to 4 trains in the full session. 2. Pusher service assignment is drawn from the Enginemen’s pool and keeps a person moderately busy for each shift of the session on the Coquihalla sub. For freight trains the pusher assists at the tail end of the train usually cutting off at the summit and returning light to Hope for the next westbound. For passenger trains, pushers are placed at the head of the train and run through from Hope to Brookmere. All Decoders are programmed so that the speed step displayed on the throttle shows the locomotive speed in scale mph which simplifies speed matching with the road engine. 3. Mine Turn is the first train out of Brookmere yard, running to Princeton and return with a further trip up to Coquihalla summit where it sets out the loads for the next westward through freight. Moderately challenging as there is a time element. 4. Coquihalla Wayfreight serves the various industries of Hope, the CN Interchange and one or two other on-line spurs all the while keeping out of the way of superior trains on the subdivision. Straight-forward and interesting. 5. Princeton Wayfreight entails a number of lifts and set-outs along the line and a good deal of switching in Princeton town. A very challenging solo job or an interesting two-man assignment. 6. Brookmere Yard Crew works the East end of the yard to make up and break down trains, switching and blocking cars according to the waybills. They co-ordinate movements within the yard and perform local switching for the Brookmere service tracks and log spur. Outbound westward trains do their own switching at the west end of the yard to make up their trains. Inbound road crews usually set out their own cabooses. A line-up is posted nearby for each of the two shifts. 7. Station Operators take orders over the phone on the authority of the Dispatcher and issue clearances which are delivered to train crews. They also record times of trains arriving and departing at their station(s) and “O S” them to the Dispatcher. Some people prefer this job; others don’t. Our usual practice is to serve one shift at the desk and another shift on the road with “seniority” given to them for their throttle job. A complete guide to performing the role as we have adapted it from the traditional CPR practice will be provided. 8. Dispatcher can make or break a session so for an experienced guest, this job is available with our regular dispatcher acting as coach as necessary. For some people it would be preferable to serve as a Station Operator before assuming the Dispatcher’s position. Canadian practice is to address “To: Engine 3627...” rather than the U S practice of “To: C & E of engine 3627...” In other words, no “C & E” (Conductor and Engineer). How can anyone waste time involving the prototype KVR and the modeling thereof? Thank you for your appreciation. I hope to resume posting soon. Same story here. I've been modelling the entire route in trains (digital) in 1:1 scale and find the I formation you share here extremely useful.